Teeth whitening can be a very effective way of lightening the natural colour of your teeth. It does this without removing any of the tooth surface or damaging the tooth itself. 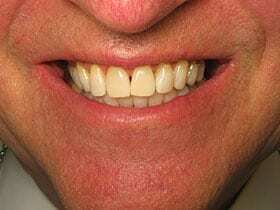 Usually the original shade of the tooth is whitened to a lighter shade or colour, rather than being turned completely white and looking out of place and unnatural in the mouth. Friends fans will remember when Ross whitened his teeth and they glowed in the dark! Nobody wants to replicate that teeth whitening mistake. Camden Place Dental Practice, Preston, aims to create a naturally looking brighter smile, using gentle but effective teeth whitening treatments which can be done from the comfort of the patients home. At Camden Place Dental Practice, located in Preston city centre, we provide ‘at home teeth whitening’. 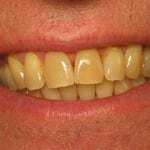 This is an effective treatment because it puts you in charge of how your teeth look after the treatment. It is a non-invasive treatment which means that it is perfectly safe for you to do at home, and means that the patient does not have to come into our Preston clinic every time to have the treatment. This is particularly good for those who do not like visiting the dentist and who feel very anxious when coming into the clinic. 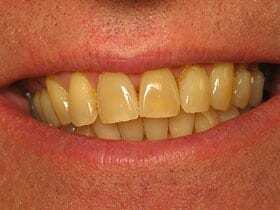 The total length of the “at-home” bleaching treatment can vary depending on how discoloured your teeth are to begin with and the desired shade you want to attain. 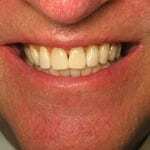 The teeth whitening process can usually be finished within two-to-four weeks from when the first treatment is complete. First, you will need to visit us at our Preston based dental practice to have impressions made for your thin upper and lower teeth whitening trays. You will then be given these customised teeth whitening trays and a whitening gel kit, which you apply regularly over the following couple of weeks as you wish. We will discuss with you exactly how long you should keep the tray in your mouth for, and any other information regarding the teeth whitening treatment when you come into our Preston clinic for your consultation and follow up appointment. So, you can carry on whitening your teeth until you reach your desired white colour or re-start whitening them when you want to ‘top up’ the shade! It’s a win-win situation. Before Teeth Whitening at Camden Place, Preston. After Teeth Whitening at Camden Place, Preston. If you have any questions regarding teeth whitening, our services, the treatments we offer or a general query about Camden Place Dental Practice, Preston, then please feel free to visit our dental practice on Winckley Square, Preston, and we can arrange a consultation where you can talk with our teeth whitening experts. We would also be happy to resolve your query over the phone, give our team a call on 01772 556 050, or you can email us at dentist@camdenplace.co.uk.